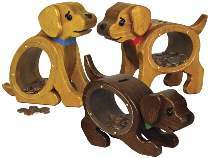 These adorable puppies make saving fun! Easy to build from 3/4" lumber. All patterns drawn FULL size. Banks measures approximately 8"H x 9" to 10-1/2"L. For each bank you build, order two each #8627 Black Eyes and one #3015 hardware package containing bank side plates, screws and coin bank plug separately.